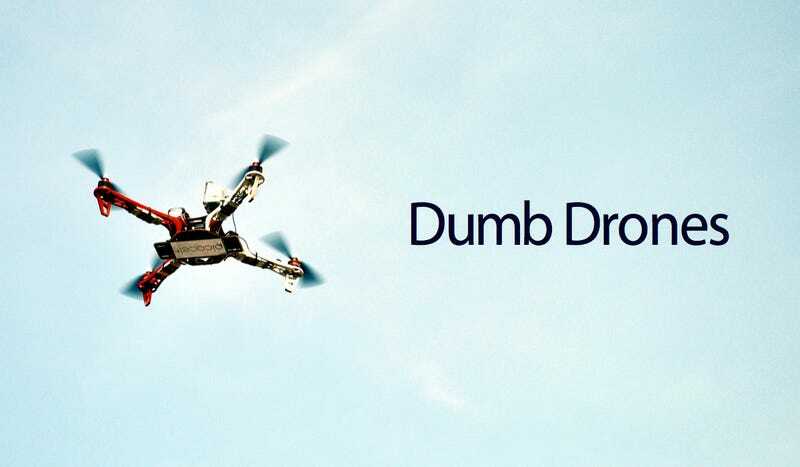 Despite our international obsession with drones—both their awesome powers and terrifying repercussions—the truth is that they're an incredibly immature technology. And, like most immature technologies, that means they’re not quite all they’re cracked up to be. In fact, drones are severely limited by a whole heap of engineering issues that are stymying their widespread adoption. Here are some of the biggest issues holding them back—and the ways engineers are planning to fix them in the future. One of the major charms of drones—aside from the fact that they're unmanned—is that they're light and nimble. But their small size and low weight comes at a cost: They can't carry much in the way of payload, or power source, for that matter. Look up the flight time of most drones and you'll be sorely disappointed. Parrot's $500 AR Drone 2.0 can only manage 12 minutes on a standard battery, while even AeroVironment's military-spec Shrike VTOL only achieves 40 airborne minutes. They're both commercial copters, admittedly, and fixed wing designs can fly a little longer: the Sensefly eBee, for instance, can manage up to 45 minutes if you're lucky, and winged military drones can stay airborne for an hour or two. Whichever way you look at it, it’s disappointing. So what’s the problem? Well, just like in every other area of technology, battery science just hasn't kept up with the rate of innovation. "Time of flight will improve but slowly, because battery technology is still poor," explains Henri Seydoux, CEO of Parrot. Sure, there's floods of battery research going on across hundreds of universities and industrial research and developments labs, but in the past decade battery tech has barely improved. Lithium-ion remains the best bet, and that's still heavy and of limited capacity. What’s required for drones is a low-weight, high power density power sources, and batteries won’t be able to deliver that for some time. But all's not lost. The future of drone power doesn't rely on batteries alone. "People are experimenting with solar cells across the wings,” explains James Mazeika from AeroVironment. “Maybe even fuel cells." It's unlikely either of those will replace batteries completely any time soon, though: solar cells of a reasonable size don't provide nearly enough power, and fuel cells are still a fairly immature technology themselves. But some combination of two or more could comfortably keep drones in the air for longer. Once you can keep a drone in the air for longer, you want to be able to do more with it, and that invariably means taking more interesting flight paths. The whole point of drones is that, on some level, they function autonomously; they're at the very least able to follow pre-programmed flight schemes or, better yet, able to react to their surroundings. Of course, it's unlikely—we hope!—that anyone would every dream of making a weaponized drone entirely autonomous, but for consumer models and micro-sized military reconnaissance craft it would be a real boon. But making a vehicle that can control itself is no mean feat. Think for a moment how long Google's been working on its driverless car. Now imagine trying to make something that flies and is capable of entirely independent motion and control. It's an insane challenge, that relies on acquiring accurate data and then making sense of it in real time. It's certainly possible to get a drone to fly a simple route by itself—the Sensefly eBee, for instance, can happily fly routes that allow it to create aerial maps without breaking a sweat. But flying through something full of hazards—say, a forest—is much more challenging. Currently, navigating a complex assault course at speed is beyond the capabilities of virtually every small drone in existence. The trouble is finding the right combination of sensors to minimize weight and maximize the quantity of data available. The likely solution lies in something like everyone's favorite household sensor: The 3D cameras which drive Kinect. "The drone can reconstruct his environment, and fly—avoiding obstacles—by itself," explains Seydoux. The plan, then, is to shrink down the 3D sensing technology to a point where a lightweight drone can carry it, along with the processing grunt to sift through the data in real time. Fortunately, we’re in a position where that can happen relatively soon. "Truly autonomous flight; I think in two years we'll have it," says Seydoux. If drones are going to become pervasive, by definition there will be a lot of them floating around our skies—both personal and commercial, civilian and military. And if the skies are full, there's also going to be rather a lot of control signals and data links required for them to communicate with the ground. Sadly, RF spectrum is already at a premium—and it's not clear that there's enough to go round to provide for all the drones that will inevitably take over the skies. "There's just not enough spectrum to go round if drones are to really break into the civil sector,” explains Mazeika. Perhaps most importantly, that means that drones are currently forced to use unprotected radio spectrum—unlike manned aircraft, which benefit from the luxury of protected frequency bands. That might not sound like a big deal, but unprotected bands are vulnerable to unintentional or intentional interference. And the last thing a drone needs is a loss of its control signals at inopportune moments. The government knows that this is problem, and it’s chiseling away to find or create or new spectrum, specifically for drones, but that’s a long, slow task. The biggest problem? “The phones carriers continue to purchase spectrums in all parts of the world that are currently being used but will not not be available in the future,” sighs Mazeika. It’s not going to be easy to wrestle spectrum out of the hands of carriers—not least because there’s an impending data crunch as well. So realistically that leaves us in a position where we need to try and make the most of the bandwidth we already have. While that’s not impossible, it’s certainly not just around the corner. Let’s just hope it can keep pace with the rate at which drones become more prolific.